In the area of production, there is a huge demand for planning and optimization tools that allow for an accelerated re-planning and reconfiguration of complex production facilities. In this context, the key words are "digital factory" or "Industry 4.0", which represents the transition to a connected, widely self-organized industrial production. This interconnectivity allows not only for the optimization of individual production steps, but also of the entire value chain. Research Group 4 coordinates a special interest group in the European Consortium for Mathematics in Industry (ECMI) on "Math for the Digital Factory". All of these goals require a thorough modelling of all aspects of the process chain together with a multi-scale simulation and optimization of complex production processes. M. Hintermüller, M. Hinze, Ch. Kahle, T. Keil, Chapter 13: Fully Adaptive and Integrated Numerical Methods for the Simulation and Control of Variable Density Multiphase Flows Governed by Diffuse Interface Models, in: Transport Processes at Fluidic Interfaces, D. Bothe, A. Reusken, eds., Advances in Mathematical Fluid Mechanics, Birkhäuser, Springer International Publishing AG, Cham, 2017, pp. 305--353, (Chapter Published), DOI 10.1007/978-3-319-56602-3 . B. Denkena, D. Hömberg, E. Uhlmann, Mathematik für Werkzeugmaschinen und Fabrikautomatisierung, in: Produktionsfaktor Mathematik. Wie Mathematik Technik und Wirtschaft bewegt, M. Grötschel, K. Lucas, V. Mehrmann, eds., acatech diskutiert, acatech, Springer, Berlin, Heidelberg, 2008, pp. 279--299, (Chapter Published). N. Alia, V. John, S. Ollila, Re-visiting the single-phase flow model for liquid steel ladle stirred by gas, Applied Mathematical Modelling. Simulation and Computation for Engineering and Environmental Systems. Elsevier Science Inc., New York, NY. English, English abstracts., 67 (2019), pp. 549--556 (published online on 21.11.2018), DOI 10.1016/j.apm.2018.11.005 . K. Sturm, M. Hintermüller, D. Hömberg, Distortion compensation as a shape optimisation problem for a sharp interface model, Computational Optimization and Applications. An International Journal, 64 (2016), pp. 557--588. We study a mechanical equilibrium problem for a material consisting of two components with different densities, which allows to change the outer shape by changing the interface between the subdomains. We formulate the shape design problem of compensating unwanted workpiece changes by controlling the interface, employ regularity results for transmission problems for a rigorous derivation of optimality conditions based on the speed method, and conclude with some numerical results based on a spline approximation of the interface. W. Bleck, D. Hömberg, U. Prahl, P. Suwanpinij, N. Togobytska, Optimal control of a cooling line for production of hot rolled dual phase steel, Steel Research International, 85 (2014), pp. 1328--1333. In this article, the optimal control of a cooling line for production of dual phase steel in a hot rolling process is discussed. In order to achieve a desired dual phase steel microstructure an optimal cooling strategy has to be found. The cooling strategy should be such that a desired final distribution of ferrite in the steel slab is reached most accurately. This problem has been solved by means of mathematical control theory. 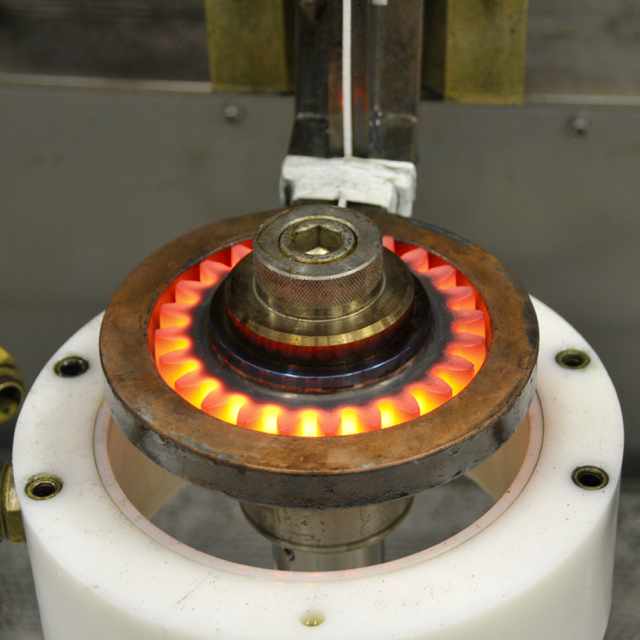 The results of the optimal control of the cooling line have been verified in hot rolling experiments at the pilot hot rolling mill at the Institute for Metal Forming (IMF), TU Bergakademie Freiberg. D. Hömberg, S. Lu, K. Sakamoto, M. Yamamoto, Parameter identification in non-isothermal nucleation and growth processes, Inverse Problems. An International Journal on the Theory and Practice of Inverse Problems, Inverse Methods and Computerized Inversion of Data, 30 (2014), pp. 035003/1--035003/24. We study non-isothermal nucleation and growth phase transformations, which are described by a generalized Avrami model for the phase transition coupled with an energy balance to account for recalescence effects. The main novelty of our work is the identification of temperature dependent nucleation rates. We prove that such rates can be uniquely identified from measurements in a subdomain and apply an optimal control approach to develop a numerical strategy for its computation. K. Chełminski, D. Hömberg, O. Rott, On a thermomechanical milling model, Nonlinear Analysis. Real World Applications. An International Multidisciplinary Journal, 12 (2011), pp. 615--632. This paper deals with a new mathematical model to characterize the interaction between machine and workpiece in a milling process. The model consists of a harmonic oscillator equation for the dynamics of the cutter and a linear thermoelastic workpiece model. The coupling through the cutting force adds delay terms and further nonlinear effects. After a short derivation of the governing equations it is shown that the complete system admits a unique weak solution. A numerical solution strategy is outlined and complemented by numerical simulations of stable and unstable cutting conditions. We study a mathematical model for laser-induced thermotherapy, a minimally invasive cancer treatment. The model consists of a diffusion approximation of the radiation transport equation coupled to a bio-heat equation and a model to describe the evolution of the coagulated zone. Special emphasis is laid on a refined model of the applicator device, accounting for the effect of coolant flow inside. Comparisons between experiment and simulations show that the model is able to predict the experimentally achieved temperatures reasonably well. This paper is concerned with the state-constrained optimal control of the two-dimensional thermistor problem, a quasi-linear coupled system of a parabolic and elliptic PDE with mixed boundary conditions. This system models the heating of a conducting material by means of direct current. Existence, uniqueness and continuity for the state system are derived by employing maximal elliptic and parabolic regularity. By similar arguments the linearized state system is discussed, while the adjoint system involving measures is investigated using a duality argument. These results allow to derive first-order necessary conditions for the optimal control problem. A. Fasano, D. Hömberg, L. Panizzi, A mathematical model for case hardening of steel, Mathematical Models & Methods in Applied Sciences, 19 (2009), pp. 2101--2126. A mathematical model for the case hardening of steel is presented. Carbon is dissolved in the surface layer of a low-carbon steel part at a temperature sufficient to render the steel austenitic, followed by quenching to form a martensitic microstructure. The model consists of a nonlinear evolution equation for the temperature, coupled with a nonlinear evolution equation for the carbon concentration, both coupled with two ordinary differential equations to describe the evolution of phase fractions. We investigate questions of existence and uniqueness of a solution and finally present some numerical simulations. D. Hömberg, D. Kern, The heat treatment of steel --- A mathematical control problem, Materialwissenschaft und Werkstofftechnik, 40 (2009), pp. 438--442. The goal of this paper is to show how the heat treatment of steel can be modelled in terms of a mathematical optimal control problem. The approach is applied to laser surface hardening and the cooling of a steel slab including mechanical effects. Finally, it is shown how the results can be utilized in industrial practice by a coupling with machine-based control. D. Hömberg, N. Togobytska, M. Yamamoto, On the evaluation of dilatometer experiments, Applicable Analysis. An International Journal, 88 (2009), pp. 669--681. The goal of this paper is a mathematical investigation of dilatometer experiments to measure the kinetics of solid-solid phase transitions in steel upon cooling from the high temperature phase. Usually, the data are only used for measuring the start and end temperature of the phase transition. In the case of several coexisting product phases, lavish microscopic investigations have to be performed to obtain the resulting fractions of the different phases. In contrast, we show that the complete phase transition kinetics including the final phase fractions are uniquely determined by the dilatometer data and present some numerical identification results. K. Chełminski, D. Hömberg, D. Kern, On a thermomechanical model of phase transitions in steel, Advances in Mathematical Sciences and Applications, 18 (2008), pp. 119--140. P. Suwanpinij, N. Togobytska, Ch. Keul, W. Weiss, U. Prahl, D. Hömberg, W. Bleck, Phase transformation modeling and parameter identification from dilatometric investigations, Steel Research International, 79 (2008), pp. 793--799. The goal of this paper is to propose a new approach towards the evaluation of dilatometric results, which are often employed to analyse the phase transformation kinetics in steel, especially in terms of continuous cooling transformation (CCT) diagram. A simple task of dilatometry is deriving the start and end temperatures of the phase transformation. It can yield phase transformation kinetics provided that plenty metallographic investigations are performed, whose analysis is complicated especially in case of several coexisting product phases. The new method is based on the numerical solution of a thermomechanical identification problem. It is expected that the phase transformation kinetics can be derived by this approach with less metallographic tasks. The first results are remarkably promising although further investigations are required for the numerical simulations. H. Alder, D. Hömberg, W. Weiss, Simulationsbasierte Regelung der Laserhärtung von Stahl, HTM Zeitschrift für Werkstoffe. Wärmebehandlung. Fertigung, 61 (2006), pp. 103--108. D. Hömberg, W. Weiss, PID control of laser surface hardening of steel, IEEE Transactions on Control Systems Technology, 14 (2006), pp. 896--904. D. Hömberg, S. Volkwein, Control of laser surface hardening by a reduced-order approach using proper orthogonal decomposition, Mathematical and Computer Modelling, 38 (2003), pp. 1003-1028. CH. Landry, M. Gerdts, R. Henrion, D. Hömberg, W. Welz, Collision-free path planning of welding robots, in: Progress in Industrial Mathematics at ECMI 2012, M. Fontes, M. Günther, N. Marheineke, eds., 19 of Mathematics in Industry, Springer, Cham et al., 2014, pp. 251--256. T. Bosse, R. Henrion, D. Hömberg, Ch. Landry, H. Leövey ET AL., C2 -- Nonlinear programming with applications to production processes, in: MATHEON -- Mathematics for Key Technologies, M. Grötschel, D. Hömberg, J. Sprekels, V. Mehrmann ET AL., eds., 1 of EMS Series in Industrial and Applied Mathematics, European Mathematical Society Publishing House, Zurich, 2014, pp. 171--187. D. Hömberg, S. Lu, K. Sakamoto, M. Yamamoto, Nucleation rate identification in binary phase transition, in: The Impact of Applications on Mathematics -- Proceedings of the Forum of Mathematics for Industry 2013, M. Wakayama, ed., 1 of Mathematics for Industry, Springer, Tokyo et al., 2014, pp. 227--243. L. Panizzi, A. Fasano, D. Hömberg, Modeling, analysis and simulations of case hardening of steel, in: Progress in Industrial Mathematics at ECMI 2008, A. Fitt, J. Norbury, H. Ockendon, E. Wilson, eds., 15 of Mathematics in Industry, Springer, Berlin et al., 2010, pp. 965--970. P. Rasper, O. Rott, D. Hömberg, E. Uhlmann, Analysis of uncertainties in the stability prediction for milling processes, in: Conference Proceedings, CIRP 2nd International Conference ``Process Machine Interactions'', June 10--11, 2010, Vancouver (CD), Y. Altintas, B. Denkena, Ch. Brecher, eds., 2010, pp. M18/1--M18/12. D. Hömberg, O. Rott, Modeling, analysis and stability of milling processes including workpiece effects, in: Progress in Industrial Mathematics at ECMI 2008, A. Fitt, J. Norbury, H. Ockendon, E. Wilson, eds., 15 of Mathematics in Industry, Springer, Berlin et al., 2010, pp. 493--498. O. Rott, P. Rasper, D. Hömberg, E. Uhlmann, A milling model with thermal effects including the dynamics of machine and work piece, B. Denkena, ed., Proceedings, 1st International Conference on Process Machine Interactions, Hannover, September 3--4, 2008, PZH Produktionstechnisches Zentrum GmbH, Garbsen, 2008, pp. 369--378. This paper deals with the development of a new mathematical model that characterizes the structure-process interaction for a complex milling system. The structure is divided into a work piece and a machine part, which are represented by different models. While the machine dynamics is characterized by a standard multi-body system, the work piece is described as a linear thermo-elastic continuum. The coupling of both parts is carried out by an empirical process model permitting an estimate of heat and coupling forces occurring during milling. This work reports the derivation of the governing equations emphasizing the coupling and summarizes the numerical algorithms being applied to solve the coupled equation system. The results of numerical simulations that show the dynamics of the complex thermo-mechanical system are presented at the end. D. Hömberg, D. Kern, The heat treatment of steel --- A mathematical control problem, in: Proceedings of the 2nd International Conference on Distortion Engineering -- IDE 2008, 17--19 September 2008, Bremen, Germany, H.-W. Zoch, Th. Lübben, eds., IWT, Bremen, 2008, pp. 201--209. CH. Meyer, D. Hömberg, J. Rehberg, W. Ring, Optimal control of the thermistor problem, in: Optimal Control of Coupled Systems of PDE, Workshop, March 2--8, 2008, 5 of Oberwolfach Reports, Mathematisches Forschungsinstitut Oberwolfach, 2008, pp. 624-626. M. Anthonissen, D. Hömberg, W. Weiss, Real-time control of surface remelting, in: Progress in Industrial Mathematics at ECMI 2004, A. Di Bucchianico, R.M.M. Mattheij, M.A. Peletier, eds., 8 of Mathematics in Industry, Springer, 2005, pp. 356--360. D. Hömberg, S. Volkwein, W. Weiss, Optimal control strategies for the surface hardening of steel, in: Proceedings of the 2nd International Conference on Thermal Process Modelling and Computer Simulation, S. Denis, P. Archambault, J.-M. Bergheau, R. Fortunier, eds., 120 of J. Physique IV, EDP Sciences, 2004, pp. 325--335. M. Hintermüller, N. Strogies, On the consistency of Runge--Kutta methods up to order three applied to the optimal control of scalar conservation laws, Preprint no. 2442, WIAS, Berlin, 2017, DOI 10.20347/WIAS.PREPRINT.2442 . Higher-order Runge-Kutta (RK) time discretization methods for the optimal control of scalar conservation laws are analyzed and numerically tested. The hyperbolic nature of the state system introduces specific requirements on discretization schemes such that the discrete adjoint states associated with the control problem converge as well. Moreover, conditions on the RK-coefficients are derived that coincide with those characterizing strong stability preserving Runge-Kutta methods. As a consequence, the optimal order for the adjoint state is limited, e.g., to two even in the case where the conservation law is discretized by a third-order method. Finally, numerical tests for controlling Burgers equation validate the theoretical results. N. Alia, Modeling and optimization of a gas-stirred liquid flow for steelmaking processes, The 20th European Conference on Mathematics for Industry (ECMI), MS27: MSO for steel production and manufacturing, June 18 - 22, 2018, University Budapest, Institute of Mathematics at Eötvös Loránd, Hungary, June 19, 2018. D. Hömberg, European collaboration in industrial and applied mathematics, Conference ``Mathematical Modelling in Metallurgical Industry'', September 17 - 18, 2018, Kristiansand, Norway, September 18, 2018. D. Hömberg, European collaboration in industrial and applied mathematics, Salzburg Mathematics Colloquium, Universität Salzburg, Fachbereich Mathematik, Austria, May 17, 2018. D. Hömberg, European collaboration in industrial and applied mathematics, Inderprastha Engineering College, Ghaziabad, India, January 5, 2018. D. Hömberg, Knowledge exchange in mathematics -- The european perspective, 1st IMA Conference on Knowledge Exchange in the Mathematical Sciences, December 3 - 4, 2018, Aston University, Birmingham, UK, December 3, 2018. D. Hömberg, Mathematical challenges in steel manufacturing, Second International Conference on Modern Mathematical Methods and High Performance Computing in Science and Technology (M3HPCST 2018), January 4 - 6, 2018, Inderprastha Engineering College (IPEC), Ghaziabad, India, January 4, 2018. D. Hömberg, Maths for digital factory, University of Southern Denmark, The Maersk Mc-Kinney Moller Institute, Odense, Denmark, October 12, 2018. C. Löbhard, A function space based solution method with space-time adaptivity for parabolic optimal control problems with state constraints, PGMO Days 2017, November 13 - 14, 2017, EDF Lab Paris Saclay, France, November 14, 2017. C. Löbhard, An ddaptive discontinuous Galerkin method for a parabolic optimal control problem with state constraints . . ., Workshop on Optimization of Infinite Dimensional Non-Smooth Distributed Parameter Systems, October 4 - 6, 2017, Darmstadt, October 4, 2017. C. Löbhard, Space-time discretization of a parabolic optimal control problem with state constraints, 18th French-German-Italian Conference on Optimization, September 25 - 28, 2017, Paderborn, September 26, 2017. D. Hömberg, From dilatometer experiments to distortion compensation -- Optimal control problems related to solid-solid phase transitions, Norwegian University of Science and Technology, Department of Mathematical Sciences, Trondheim, Norway, November 3, 2017. D. Hömberg, MSO for steel production and manufacturing, Workshop ``Future and Emerging Mathematical Technologies in Europe'', December 11 - 15, 2017, Lorentz Center, Leiden, Netherlands, December 11, 2017. M.H. Farshbaf Shaker, Allen--Cahn MPECs, WIAS-PGMO Workshop on Nonsmooth and Stochastic Optimization with Applications to Energy Management, May 10 - 12, 2016, WIAS Berlin, May 11, 2016. D. Hömberg, European collaboration in Industrial and Applied Mathematics, The 19th European Conference on Mathematics for Industry (ECMI 2016), Minisymposium 38 ``Maths in HORIZON 2020 and Beyond'', June 13 - 17, 2016, Universidade de Santiago de Compostela, Spain, June 15, 2016. D. Hömberg, Nucleation, growth, and grain size evolution in multiphase materials, INdAM Workshop ``Special Materials in Complex Systems -- SMaCS 2015'', May 18 - 22, 2015, Rome, Italy, May 21, 2015. D. Hömberg, Optimal coefficient control for semilinear parabolic equations, Fudan University, School of Mathematical Sciences, Shanghai, China, March 10, 2015. D. Hömberg, The digital factory -- A perspective for a closer cooperation between math and industry, Workshop ``Mathematics and Computer Science in Practice: Potential and Reality'', December 9 - 11, 2015, Prague, Czech Republic, December 9, 2015. D. Hömberg, Nucleation, growth, and grain size evolution in dual phase steels, Workshop ``Recent Developments and Challenges in Interface and Free Boundary Problems'', March 25 - 28, 2014, University of Warwick, UK, March 26, 2014. D. Hömberg, Nucleation, growth, and grain size evolution in dual phase steels, The 18th European Conference on Mathematics for Industry 2014 (ECMI 2014), Minisymposium 37: Simulation and Control of Hot-rolling, June 9 - 13, 2014, Taormina, Italy, June 9, 2014. D. Hömberg, Nucleation, growth, and grain size evolution in dual phase steels, Wrocław University of Technology, Institute of Mathematics and Computer Science, Poland, July 1, 2014. D. Hömberg, Optimal control and shape design problems in thermomechanics, BMS-WIAS Summer School ``Applied Analysis for Materials'', August 25 - September 5, 2014, Berlin Mathematical School, Technische Universität Berlin, September 1, 2014. J. Rehberg, Maximal parabolic regularity on strange geometries and applications, Joint Meeting 2014 of the German Mathematical Society (DMV) and the Polish Mathematical Society (PTM), September 17 - 20, 2014, Adam Mickiewicz University, Faculty of Mathematics and Computer Science, Poznan, Poland, September 18, 2014. D. Hömberg, Modelling, analysis and simulation of multifrequency induction hardening, Forum Math-for-Industry 2013 ``The Impact of Applications on Mathematics'', November 4 - 8, 2013, Kyushu University, Fukuoka, Japan, November 7, 2013. CH. Landry, Time-optimal control for robot motion planning, Universität Bayreuth, Lehrstuhl für Ingenieurmathematik, June 6, 2011. N. Togobytska, Simulation, Optimierung und Regelung von Gefügebildung und mechanischen Eigenschaften beim Warmwalzen von Mehrphasenstählen, 9. Kolloquium zum DFG SPP 1204 ``Algorithmen zur schnellen, werkstoffgerechten Prozesskettengestaltung und -analyse in der Umformtechnik'', Siegen, April 6, 2011. N. Togobytska, Simulation, optimisation and control of microstructure evolution and mechanical properties during hot rolling of multiphase steels, 10. Kolloquium zum DFG SPP 1204 ``Algorithmen zur schnellen, werkstoffgerechten Prozesskettengestaltung und -analyse in der Umformtechnik'', Freiberg, November 8, 2011. CH. Landry, A minimum time control problem for the collision-free robot motion planning, 82th Annual Meeting of the International Association of Applied Mathematics and Mechanics (GAMM 2011), Session on Optimal Control and Applications, April 18 - 21, 2011, Technische Universität Graz, Austria, April 20, 2011. CH. Landry, A back-face culling to speed up the resolution of an optimal control problem in robot motion planning, ENUMATH 2011, September 5 - 9, 2011, University of Leicester, UK, September 5, 2011. CH. Landry, Path-planning with collision avoidance in automotive industry, 25th IFIP TC 7 Conference on System Modeling and Optimization, September 12 - 16, 2011, Technische Universität Berlin, September 16, 2011. CH. Landry, How to avoid collisions between translating robots, Summer School ``Optimal Control of Partial Differential Equations'', July 12 - 17, 2010, Cortona, Italy, July 15, 2010. O. Rott, An iterative method for the multipliers of periodic delay-differential equations and the analysis of a PDE milling model, 9th IFAC Workshop on Time Delay Systems, June 7 - 9, 2010, Czech Technical University, Prague, Czech Republic, June 8, 2010. O. Rott, Analysis of uncertainties in the stability prediction for milling processes, 2nd International Conference ``Process Machine Interactions'', June 10 - 11, 2010, The University of British Columbia, Vancouver, Canada, June 11, 2010. N. Togobytska, An inverse problem for laser-induced thermotherapy arising in tumor tissue imaging, Chemnitz Symposium on Inverse Problems 2010, September 23 - 24, 2010, September 24, 2010. N. Togobytska, Simulation, Optimierung und Regelung von Gefügebildung und mechanischen Eigenschaften beim Warmwalzen von Mehrphasenstählen, 8. Kolloquium zum DFG SPP 1204 ``Algorithmen zur schnellen, werkstoffgerechten Prozesskettengestaltung und -analyse in der Umformtechnik'', Aachen, November 10, 2010. D. Hömberg, Coupling of process, machine, and work-piece in production processes --- A challenge for industrial mathematics, Warsaw Seminar on Industrial Mathematics (WSIM'10), March 18 - 19, 2010, Warsaw University of Technology, Poland, March 19, 2010. D. Hömberg, Modelling, simulation and control of phase transformations in steel, Nippon Steel Corporation, Chiba, Japan, September 10, 2010. D. Hömberg, Multiphase steels, heat treatment and distortion --- Mathematical challenges in steel production and manufacturing, Summer School ``High Performance Computing'' (organizer: TU Ilmenau), September 29 - October 2, 2010, Upstalsboom Hotel Friedrichshain, Berlin, September 30, 2010. D. Hömberg, Steel manufacturing --- A challenge for applied mathematics, Universität Duisburg-Essen, Fachbereich Mathematik, May 11, 2010. D. Kern, Optimal control of a thermomechanical model including transformation induced plasticity, SIAM Conference on Control and its Applications, July 6 - 8, 2009, Denver, USA, July 8, 2009. N. Togobytska, Parameter identification for the phase transformations in steel, Conference on Applied Inverse Problems 2009, July 20 - 24, 2009, University of Vienna, Austria, July 21, 2009. N. Togobytska, Parameter identification from dilatometric investigations, SIAM Conference on Control and its Applications, July 6 - 8, 2009, Denver, USA, July 8, 2009. N. Togobytska, Simulation, Optimierung und Regelung von Gefügebildung und mechanischen Eigenschaften beim Warmwalzen von Mehrphasenstählen, 8. Kolloquium zum DFG SPP 1204 ``Algorithmen zur schnellen, werkstoffgerechten Prozesskettengestaltung und -analyse in der Umformtechnik'', WIAS Berlin, June 23, 2009. D. Hömberg, Coupling of process, machine, and work-piece in production processes --- A challenge for industrial mathematics, Workshop ``Industrial Mathematics and its Practice'', February 23 - 24, 2009, University of Tokyo, Japan, February 23, 2009. D. Hömberg, Die Wärmebehandlung von Stahl --- Thermomechanische Modellierung, Simulation und Optimierung, Technische Universität Dortmund, Fakultät Maschinenbau, January 22, 2009. D. Hömberg, Direct and inverse problems related to phase transitions and distortion in modern multi-phase steels, Workshop ``Mathematical Models and Analytical Problems for Special Materials'', July 9 - 11, 2009, Università degli Studi di Brescia, Italy, July 9, 2009. D. Hömberg, Distortion compensation --- An optimal control approach, 24th IFIP TC 7 Conference on System Modelling and Optimization, July 27 - 31, 2009, Buenos Aires, Argentina, July 27, 2009. D. Hömberg, Interactions between machine, work-piece, and process dynamics in milling machines, SIAM Conference on Mathematics for Industry: Challenges and Frontiers (MI09), October 9 - 10, 2009, San Francisco, USA, October 9, 2009. D. Hömberg, Optimal control of heat treatments and stability of milling processes --- Two case studies from industrial mathematics, Worcester Polytechnic Institute, Mechanical Engineering Department, USA, October 7, 2009. D. Hömberg, The mathematics of distortion, University of Delaware, Department of Mathematical Sciences, Newark, USA, October 6, 2009. O. Rott, A milling model with thermal effects including the dynamics of machine and workpiece, 1st International Conference on Process Machine Interactions (PMI 2008), September 3 - 4, 2008, Leibniz Universität Hannover, September 3, 2008. O. Rott, Modeling, analysis and stability of milling processes including workpiece effects, The European Consortium for Mathematics in Industry (ECMI 2008), June 30 - July 4, 2008, University College, London, UK, July 3, 2008. O. Rott, Numerical solution of a milling model including thermoelastic workpiece effects, Universität Dortmund, Fachbereich für Mathematik, June 23, 2008. O. Rott, Parameter für ein MKS-Modell einer Fräsmaschine, DFG SPP 1180 Workshop ``Parameteridentifikation bei Werkzeugmaschinen'', February 21 - 22, 2008, WIAS Berlin, February 22, 2008. O. Rott, Semiimplizite Zeitintegration eines gekoppelten Systems aus partiellen und gewöhnlichen Differentialgleichungen mit Retardierung, DFG SPP 1180 Workshop ``Modellierungstechnologien'', May 29 - 30, 2008, Dresden, May 30, 2008. N. Togobytska, On the evaluation of the dilatometer experiments, Chemnitz Symposium on Inverse Problems 2008, September 25 - 26, 2008, September 25, 2008. N. Togobytska, Simulation, Optimierung und Regelung von Gefügebildung und mechanischen Eigenschaften beim Warmwalzen von Mehrphasenstählen, Antragskolloquium zum DFG Schwerpunktprogramm 1204/2, Bonn, May 20, 2008. W. Bleck, D. Hömberg, Ch. Keul, U. Prahl, P. Suwanpinij, N. Togobytska, Simulation, Optimierung und Regelung von Gefügebildung und mechanischen Eigenschaften beim Warmwalzen von Mehrphasenstählen, Workshop ``MEFORM 2008: Simulation von Umformprozessen'', Freiberg, March 26 - 28, 2008. D. Hömberg, Modellierung und Optimierung der Gefügeumwandlung in niedrig legierten Stählen und Anwendungen, Salzgitter Mannesmann Forschung GmbH, February 19, 2008. D. Hömberg, On a mathematical model for high-speed milling including the dynamics of machine and work-piece, Conference ``Direct, Inverse and Control Problems for PDE's'' (DICOP 08), September 22 - 26, 2008, Cortona, Italy, September 26, 2008. D. Hömberg, Prozesskette Stahl, Workshop of scshape Matheon with Siemens AG (Industry Sector) in cooperation with Center of Knowledge Interchange (CKI) of Technische Universität (TU) Berlin and Siemens AG, TU Berlin, September 29, 2008. D. Hömberg, Solid-solid phase transitions --- Analysis, optimal control and industrial application, Warsaw University of Technology, Faculty of Mathematics and Information Science, Poland, February 14, 2008. D. Hömberg, The heat treatment of steel --- A mathematical control problem, 2nd International Conference on Distortion Engineering 2008, September 17 - 19, 2008, Bremen, September 19, 2008. D. Kern, Optimal control of a thermo-mechanical model of phase transitions in steel, 13th Czech-French-German Conference on Optimization, September 17 - 21, 2007, Heidelberg, September 20, 2007. W. Weiss, Control of laser surface hardening, 6th International Congress on Industrial and Applied Mathematics (ICIAM 2007), July 16 - 20, 2007, ETH Zürich, Switzerland, July 19, 2007. W. Weiss, Simulationsbasierte Regelung der Laserhärtung von Stahl, Ruhr-Universität Bochum, Institut für Werkstoffe, May 30, 2007. D. Hömberg, D. Kern, Optimal control of a thermomechanical model of phase transitions in steel, 6th International Congress on Industrial and Applied Mathematics (ICIAM 2007), July 16 - 20, 2007, ETH Zürich, Switzerland, July 19, 2007. D. Hömberg, Mathematical tools for the simulation and control of heat treatments, Delphi, Puerto Real, Spain, January 16, 2007. D. Hömberg, Mathematics for complex production processes, Comau, Turin, Italy, March 23, 2007. D. Hömberg, Mathematics for steel production and manufacturing, Nippon Steel, Kimitsu, Japan, March 1, 2007. D. Hömberg, On a thermomechanical phase transition model for the heat treatment of steel, Universidad de Cádiz, Departamento de Matemáticas, Puerto Real, Spain, January 15, 2007. D. Hömberg, On a thermomechanical phase transition model for the heat treatment of steel, Fudan University, Department of Mathematics, Shanghai, China, March 5, 2007. D. Hömberg, Optimal control of semilinear parabolic equations and an application to laser material treatments (part I), University of Tokyo, Department of Mathematical Sciences, Japan, February 21, 2007. D. Hömberg, Optimal control of semilinear parabolic equations and an application to laser material treatments (part II), University of Tokyo, Department of Mathematical Sciences, Japan, February 22, 2007. D. Hömberg, Phase transition models for multiphase steels, Industrial and Interdisciplinary Workshop ``Problems Related to the Manufacture of Multiphase Steels'', University of Oxford, Oxford Centre for Industrial and Applied Mathematics, UK, November 2, 2007. D. Hömberg, Solid-solid phase transitions in steel --- modeling, simulation and optimal control, Universitá di Pavia, Dipartimento di Matematica, Italy, March 27, 2007. D. Hömberg, Thermomechanical phase transition models --- analysis, optimal control and industrial applications, University of Oxford, Oxford Centre for Industrial and Applied Mathematics, UK, October 11, 2007. D. Hömberg, Die Wärmebehandlung von Stahl --- ein Optimierungsproblem, Universität Bremen, SFB 570 ``Distortion Engineering'', March 2, 2006. D. Hömberg, Laser surface hardening --- modelling, simulation and optimal control, 4th Korean-German Seminar on Applied Mathematics and Physics, September 24 - October 1, 2006, Erlangen, September 26, 2006. D. Hömberg, Modellierung, Simulation und Optimierung der Wärmebehandlung von Stahl, Endress+Hauser Flowtec AG, Reinach, Switzerland, May 15, 2006. D. Hömberg, Optimal control of a thermomechanical phase transition model, 12th IEEE International Conference on Methods and Models in Automation and Robotics, August 28 - 31, 2006, Miedzyzdroje, Poland, August 29, 2006. D. Hömberg, Optimal control of laser material treatments, 21st European Conference on Operational Research (EURO XXI), July 3 - 5, 2006, Reykjavik, Iceland, July 3, 2006. D. Hömberg, Phasenübergänge in Stahl, Summer School ``Simulation und Anwendungen von Mikrostrukturen'', August 14 - 18, 2006, Föhr. D. Hömberg, Thermomechanical models of phase transitions --- modelling, control and industrial applications, Escuela Politécnica Nacional, Departamento de Matématica, Quito, Ecuador, November 13, 2006. D. Hömberg, A thermomechanical phase transition model for the surface hardening of steel, International Conference ``Free Boundary Problems: Theory and Applications'', June 7 - 12, 2005, Coimbra, Portugal, June 11, 2005. D. Hömberg, Control of laser material treatments, SIAM Conference on Mathematics for Industry, October 24 - 26, 2005, Detroit Marriott Renaissance Center, USA, October 25, 2005. D. Hömberg, Die Laserhärtung von Stahl --- Modellierung, Analysis und optimale Steuerung, Universität Bayreuth, Mathematisches Institut, June 30, 2005. D. Hömberg, Entwicklung eines Prognosetools zur Identifizierung von stabilen Fräsprozessen, DFG SPP 1180, Garbsen, May 19, 2005. D. Hömberg, Laser material treatments --- modeling, simulation, and optimal control, Michigan State University, Department of Mathematics, East Lansing, USA, October 27, 2005. D. Hömberg, Modelling, simulation and control of laser material treatments, Scuola Normale Superiore, Pisa, Italy, November 22, 2005. D. Hömberg, On a thermomechanical model of surface heat treatments, EQUADIFF 11 International conference on differential equations, July 25 - 29, 2005, Comenius University, Bratislava, Slovakia, July 28, 2005. D. Hömberg, Optimal control of solid-solid phase transitions including mechanical effects, Workshop ``Optimal Control of Coupled Systems of PDE'', April 17 - 23, 2005, Mathematisches Forschungsinstitut Oberwolfach, April 22, 2005. D. Hömberg, Von der Stahlhärtung bis zur Krebstherapie --- Simulations- und Optimierungsaufgaben in Lehre und Forschung, FEMLAB Konferenz 2005, November 3 - 4, 2005, Frankfurt am Main, November 3, 2005. D. Hömberg, Modellierung, Analysis und optimale Steuerung der Lasermaterialbearbeitung, Kolloquium der Angewandten Mathematik, Universität Münster, December 3, 2004. D. Hömberg, Modelling, simulation and control issues in laser-induced thermotherapy, 13-th European Conference on Mathematics for Industry (ECMI 2004), June 21 - 25, 2004, Eindhoven University of Technology, Eindhoven, Netherlands, June 22, 2004. D. Hömberg, On a thermomechanical model of phase transitions in steel, INdAM Workshop ``Dissipative Models in Phase Transitions'', September 5 - 11, 2004, Cortona, Italy, September 10, 2004. D. Hömberg, On a thermomechanical model of surface heat treatments, University of Tokyo, Department of Mathematical Sciences, Japan, October 14, 2004. D. Hömberg, Optimal control of laser surface hardening, University of Chiba, Department of Mathematics and Informatics, Japan, October 19, 2004. D. Hömberg, Simulation und Optimierung der Lasermaterialbearbeitung, Seminar des Forschungsschwerpunktes Photonik, Technische Universität Berlin, Optisches Institut, June 18, 2004. D. Hömberg, Thermoelastische Phasenübergänge in Stahl, Humboldt-Universität zu Berlin, Institut für Mathematik, May 13, 2004. D. Hömberg, Widerstandsschweißen und Oberflächenhärtung von Stahl --- Modellierung, Analysis und optimale Steuerung, Colloquium of Sfb 393, Technische Universität Chemnitz, Institut für Mathematik, February 13, 2004. D. Hömberg, A mathematical model for capacitor resistance welding, 5th International Congress on Industrial and Applied Mathematics (ICIAM 2003), July 7 - 11, 2003, Sydney, Australia, July 10, 2003.